Summary: SLIGHT category for severe weather. Chance of severe storms during the day on Thursday as a cold front approaches. Best chance for us is mid morning through lunch time. Main threat damaging winds, with an isolated tornado. Note: more information and an updated outlook will be issued by the Storm Prediction Center overnight. Any new information will be added to this post at the beginning of the post noted with a time. 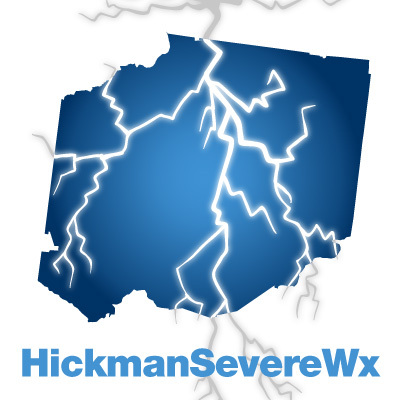 Follow us on Twitter @HickmanSevereWx for the latest information. 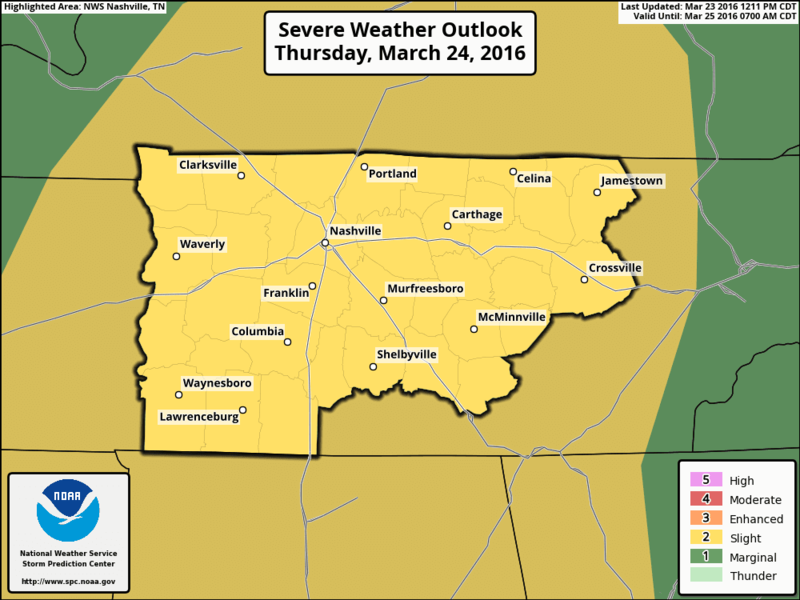 It’s been a bit since we’ve had a chance for severe weather. 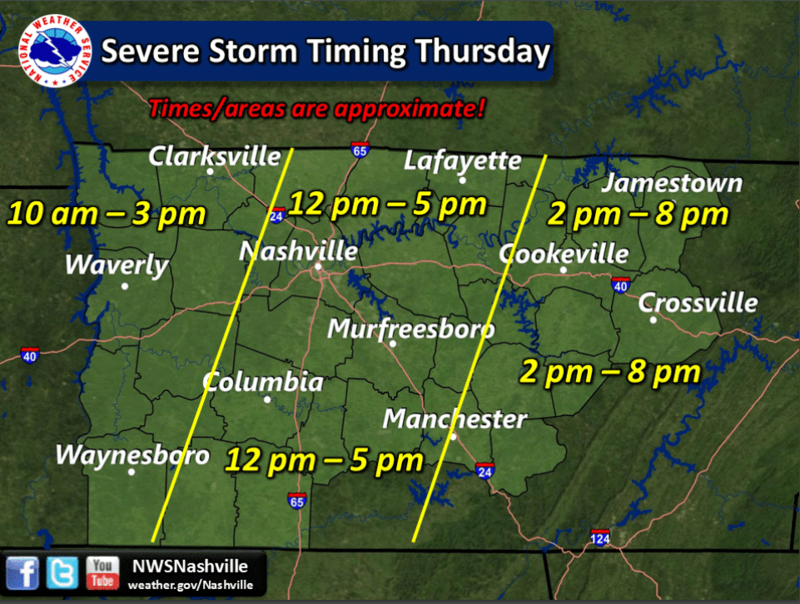 We’re in the prime severe weather season for Middle Tennessee, but it’s taken a little time to get ramped up it appears. The Storm Prediction Center (SPC) has placed us in the SLIGHT category for severe weather for Thursday 7am through Friday 7am. With this carries a 15% chance of seeing severe weather within 25 miles of a point. The main threat for this storm system is damaging winds, with an isolated tornado possible along with a small chance of hail. The storms will move in ahead of a cold front in a line formation. Currently, the latest thinking is that the storms will impact Hickman County between 10am and 3pm, but we will talk more about timing below since the models aren’t helping us out much. So, what do the models have to say about this storm system? They can’t seem to agree on when they are arriving and what kinds of storms we will have. The main factor here is how much instability (CAPE) will be in the atmosphere when those storms move through. Instability increases with daytime heating, so most of the times the storms start to build and get stronger as the day goes on. Instead of us being at the end of a day and seeing these storms (aka nighttime storms), we are instead going to see them during the day. 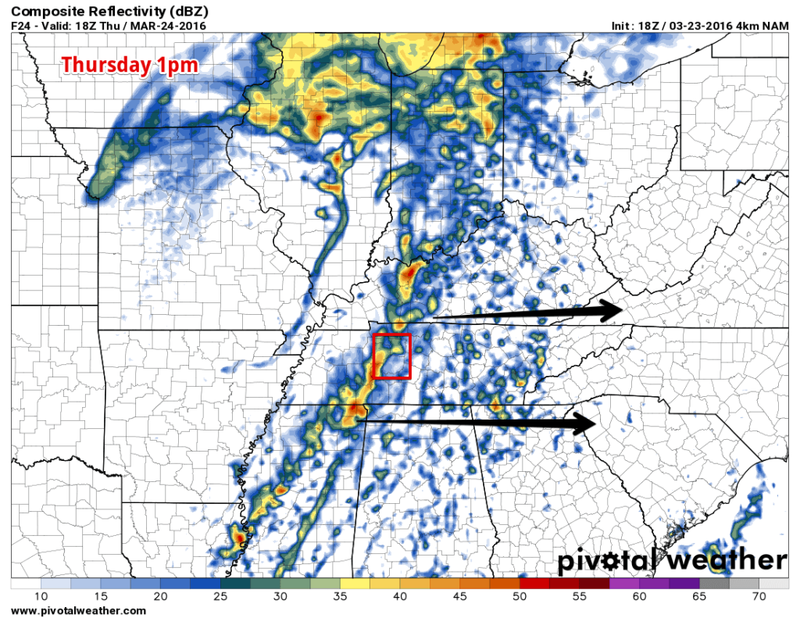 However, we will likely not be seeing them during the peak instability of the day (afternoon and evening). Long story short, timing may indeed play a factor in how unstable (instability – CAPE) the atmosphere gets before the storms come through. The more CAPE, the better chance for severe weather. With those things in mind, let’s look through the models. NAM4 tends to overestimate weather slightly. It currently shows the line of storms reaching us at about 1pm Thursday, after the daytime heating of the day has kicked in to hep build the storms. Here’s the simulated radar for 1pm Thursday from NAM4. The brighter colors (yellows, oranges, reds) is about where they estimate the line of storms is. The black arrows indicate the direction of the line of storms. For the weather nerds, the sounding at this time shows a CAPE of 150-225 j/kg, which means there ins’t much instability in the air. Now for the HRRR, which isn’t quite in range yet but is updating every hour, shows an interesting take on tomorrow’s storms. It shows rain developing out ahead of the storms, which may help stabilize the atmosphere. If the HRRR was to continue after 15 hours in the future (it doesn’t, but let’s act like it did), it estimates the main line to be here later than NAM4, roughly 1-4pm. 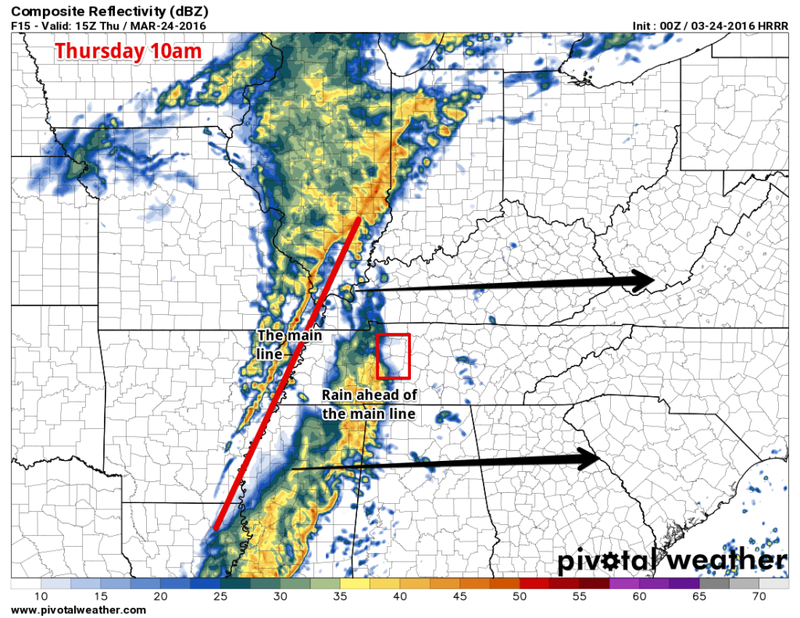 Here’s the HRRR simulated radar for 10am, showing the main line and the rain ahead of the line. Wait, you said there is a slight chance of isolated tornadoes? Yep. But it is an isolated chance of tornadoes. You can never rule out a tornado or two along the line of the storms, but we aren’t anticipating a widespread tornado event. This is more of a straight line damaging wind threat, with a possible tornado or two, and maybe some hail if the storms get strong enough. Overall, it’s a good day to stay weather aware, but not a panic and freakout kind of storm system. For one, there isn’t much stability forecasted for the storms to gobble up and grow. It’s important to note though that there is uncertainty with this forecast, which is why NWS has such wide timeframes. 1.) We can’t seem to pinpoint exact timing and 2.) The amount of CAPE in the atmosphere is still different from model to model. Stay aware of the weather tomorrow, since this is coming through during work hours and during lunch and possibly when schools are letting out.